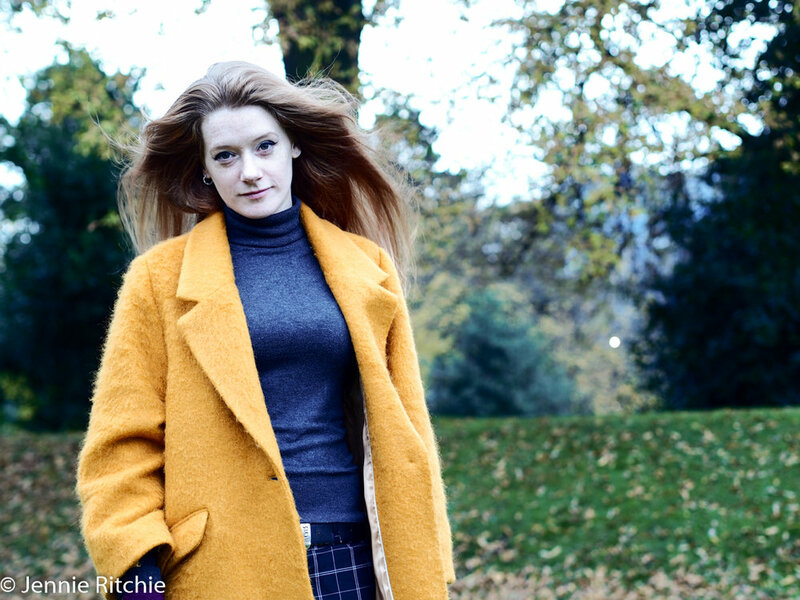 Hazel Coonagh is flowing autumnal in a yellow full-length coat and long red hair. I asked her where to meet. She suggested the Iveagh Gardens as a good shooting location “near enough to St Stephen’s Green to be accessible, but less busy”. Her make-up is considered just as her words. For someone so young, Hazel is accomplished and poised. She knows her business and today that puts her on the other side of the camera lens from where she is accustomed to be. This fashion savvy photographer has learned her trade well. Three internships straight out of a degree from DIT in Visual Communications gave her skills in product photography, a start on a now impressive portfolio, a long list of worthy contacts and an inability to ever drink coffee again. 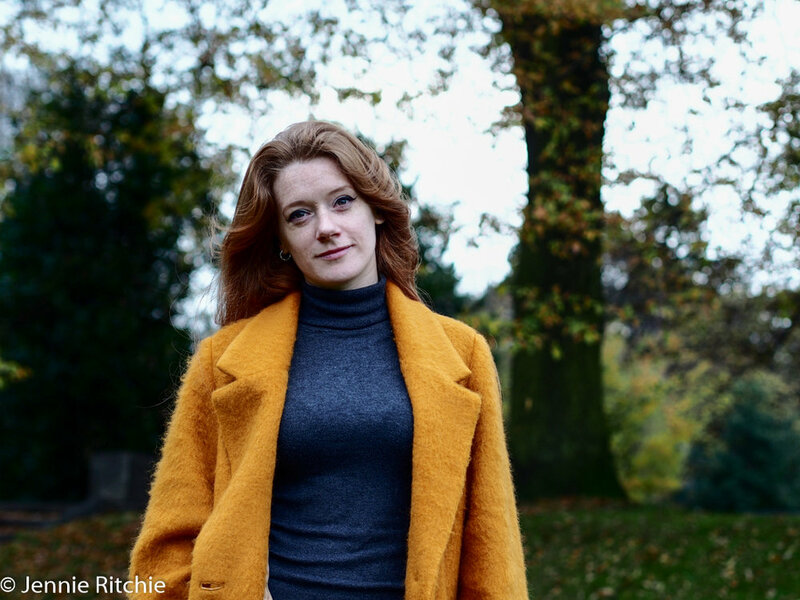 Her current work is varied – magazines, editorial, musicians “I love working with musicians” and theatre companies. She did a series of photographs for Token, the new ‘barcade’ in Dublin “just to be involved”. As a child she marvelled at cameras “magical and cool mechanical objects that could capture someone’s face”. Family collections of old sepia photographs of a bygone generation captured her imagination. Hazel’s photography today is not steeped in the past. It is very much the present and the future. In her own time, she is developing a personal style “more fine art driven, self-portraits and mixed media. This way I am completely fulfilled artistically. It would be nice in the future to do my personal work for professional clients”. “Dublin photographer, visual artist and bedroom musician” says her clipped bio. Who do you like musically? I ask. “How long have you got?” she laughs. At the end of the day it is the rain that stops play though. My notebook and glasses are speckled with raindrops. We part with a hug. I feel like the nerdy one at school that would like to be friends with the popular, successful and beautiful arty girl. Hazel Coonagh is all of those and more. Tell me a little about your background, where you are from and how you got into photography? I was born in Dublin and raised in Ashbourne until I was about 4 years old. Then my family moved to Glasnevin, where my folks still live. I got in to photography at an early age... in a sense. At some point in my childhood I was introduced to what a camera was and I was fascinated with them and the images they produced, as if by magic. My first camera was like toy that I played with, even when there wasn’t film in it I liked to pretend there was. It was bought for a couple of quid at a sale of work in someone’s house near my grandparents - I think I was about 8. As a teenager I would shoot about a roll of film a week - times spent hanging out with my mates, nothing artistic about it, just for the craic. I have boxes full of them, overflowing with memories of a bunch of smelly metalers and misfits getting up to all sorts. It wasn’t until I was in my late teens that I saw the possibilities of using photography as an artistic medium. I had adored art since I was a child but wasn’t the best at drawing or painting. Once I found creative photography it was simply the right fit. I learned how to use a fully manual film camera at 17 and I was totally hooked. I did a PLC course after school and went on get my BA in Visual Communication where I specialised in photography and image making. I work mainly in editorial photography in my day to day, which can encompass various things. But I specialise in anything to do with photographing people. I’m drawn to many of facets of portraiture, be it documentary, fine art, life style, beauty etc. Photos of people are just the most captivating to me. I’ve recently been experimenting with aspects of mixed media and bringing those elements into portrait photography, which I’ve really been enjoying. From a technical view point, a good photograph could be one with the most interesting or beautiful light, the strongest composition or angles, one that showcases the best use of colour, tones, depth, etc. Or you can look at the emotion or message behind an image - capturing a rare moment that tells a complicated story or something that simply makes you really feel something or think about something in a different way. I think the best photographs are the ones who manage to marry both meaning and some level of aesthetics. Do you have a set idea in your mind when you go to a shoot or is it spontaneous? This depends, but ideally I like to have things planned out as much as I can. I’ll sketch out a few ideas before a shoot, try to capture them and then start improvising. It’s usually the improvised shots that work out best, but I think it’s harder to get there if I haven’t planned in advance. It gives you a good foundation to feel more free and play around. Tell me about one of your favourite shoots? One that always stands out, is a shoot I did with a theatre company called Company SJ. We shot on location at the Pigeon House at Poolbeg, which was a building I had been wanting to get into for years. My father worked at the EBS station next door where I had shot a documentary series a few years previously, but we couldn’t get permission for the Pigeon House at that time. Then, while working with Company SJ, the director, Sarah, managed to get us in with a guide to shoot with actor Raymond Keane for their upcoming Samuel Beckett production ‘Fizzles’. I’m most proud of these images as I feel there is a delicacy and pain to them, expressed within an incredible, forgotten, cavernous space. It was a surreal and wonderful experience that will always be close to my heart. What kind of camera do you use regularly? Do you like to play with other cameras too? I shoot on a Canon 5D Mrk II and have 7D as a back up, but to be honest my favourite camera is my Holga. It’s a cheap little plastic film camera that can shoot multiple exposures on 120 film. I think I’ll always prefer film to digital even though I shoot digital 95% of the time. Something about the excitement and mystery of what will end up on a print in your hand is part of what made me fall in love with photography in the first place, so it’s tough to beat. When you started out, how did you get new clients? What advice would you give to someone keen to get into the industry? Internships and assisting. That’s what worked for me, research internships and photographers you want to learn from. You also have got to be persistent. Is Dublin a good place to work? I love working in Dublin. It’s a small community but that’s part of what I like about it, you get to know people, make friends and run in to familiar faces on the regular. Dublin has a huge amount of talented people in it and I’m very happy to be working among them. Do you have an inspiration board in your workplace or how do you keep inspired to create new images? I’m really fascinated about where inspiration comes from as it’s not always as straight forward as seeing something you like, taking a conscious note of it and attempting to replicate it in some way. I saw an artist called VON speak a few years ago at Offset Dublin, who demonstrated how he had been influenced by a Radiohead video without realising it until he happened upon it years later after sort of forgetting about it. It really blew my mind when I saw it and it stuck with me ever since. Since then I’ve tried to keep an eye out for possible old forms of inspiration that had made their way in to my subconscious. I haven’t had any totally clear moments of realisation yet that I can remember but it did make me understand a few things. My father brought me and my brother up with a lot of great films and music which I think had a massive impact on me all round. I think that helped me gain general creativity and an eye for composition, which I always seemed to have a knack for with photography. Music is something that was always there and it is a huge part of my life. I take inspiration from it in my personal work more and more, attempting to make a visuals to match the lyrics or emotion of a song. Also my mother ran a comic and occult book store in Temple Bar called the Alchemists Head until I was about 8, since then I’ve always felt a closeness to comic art work and graphic novels which I think have made some impact on some of my work. Some aspects of which are more obvious then others, like using the characters from comics but giving them a different angle. Other then that I take inspiration from things I see online or from books. I like to look at painters, cinematography and illustrators, I find it helpful to look outside of my own medium. Who are the other creatives working in Ireland that you admire? Denise Nestor is an illustrator I really admire. She draws mainly portraits and animals in pencil, the beauty and skill level of which is just staggering. Will St. Leger is a street artist and activist with incredible heart and fight, he’s a very socially conscious artist and very inspiring person to work with. Sara Vogel is a model, piercer, performer and closest thing I have to a muse. We are frequent collaborators so you’re likely to see her pop up in a lot of my work. She has a background in dance and acting which always helps to give a model an edge. Plus she’s gutsy, very hard working and amazing craic! 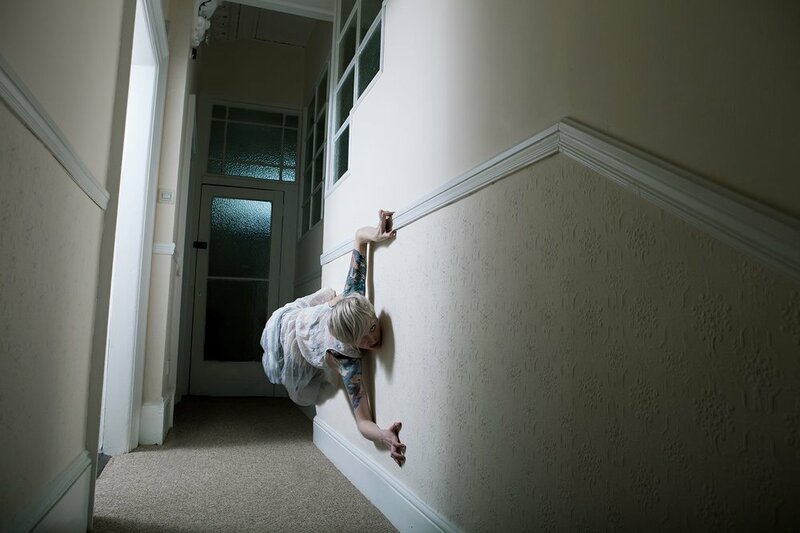 Laura Sheeran is a beast, she’s a musician, film maker, photographer and producer. She really blows me away, she has such an amazing attitude. Aine Macken is a painter and writer who has such a beautiful soul and wit. Claire O’Connor is a fine artist and educator who is extremely dedicated to her work and a total master at what she does. You describe yourself as a bedroom musician? Do tell! Well basically I’ve spent most of my life singing and playing guitar in the confines of my bedroom. When I was a kid I thought I’d grow up to be a musician but then I got older and learned the reality of just how difficult that can be and I didn’t think I could take the heartbreak to pursue it. Music will always be closest to me, I’ll always play music for myself and sometimes for others, but only if I am drunk. Where are your favourite hangouts in Dublin or a favourite secret spot? When you need to escape from the city, where do you like to go? The Magazine Fort in the Phoenix Park is a beautiful spot that I recently came to appreciate since moving close by. Also the War Memorial Gardens are absolutely stunning - they have a lost in time kind of vibe where you can forget about the rest of the world. Career-wise, what are your dreams and aspirations? If I’m totally honest I don’t know right now. I have a few things in the back of my mind. I spoke recently at my old college and since then I’ve been thinking about doing a masters, I never studied photography full time before and I’ve always wanted to… I'd better start saving. And of course .... your favourite musicians? The Beastie Boys, David Bowie, Fiona Apple, Sheryl Crow, Soundgarden, Steve Earle, Brian Eno, The Rolling Stones, Rory Gallagher, Damien Dempsey, Santigold, Bruce Springsteen, Gillian Welch, Beck, Bob Dylan, Grimes, Tricky, Massive Attack, Neil Young, Nina Simone, Missy Elliot, Loudon Wainwright, OK Go, Radiohead, Led Zeppelin, Paul Simon, The Roots, Townes Van Zandt. Also, I just found a musician called John Blek who is amazing, check him out for sure.